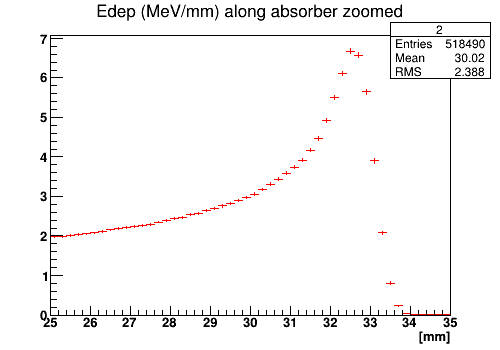 This example shows the dose distribution in water along the incident proton beam. The beam hits the water cube surface and deposits a dose under the surface of the water. The volume of the water cube is divided into slices perpendicular to the incident beam. 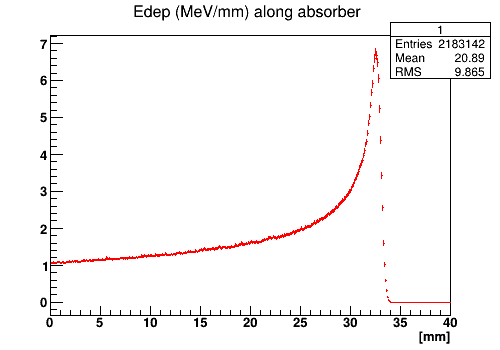 At each slice the deposited dose and energy is computed. The slices are created using class G4PVReplica. The energy and the dose are scored using classes G4UserSteppingAction and G4UserRunAction. 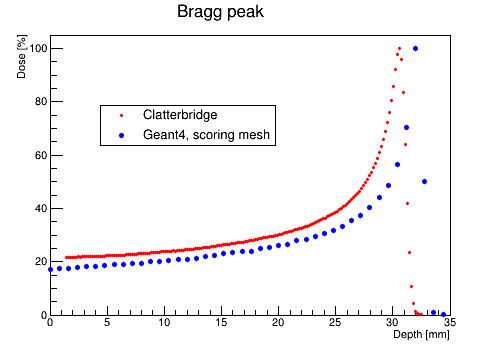 Alternatively, the energy and the dose are scored using class G4ScoringManager by defining two scoring meshes in longitudinal and lateral direction of the beam. More information about the scoring meshes can be found here. 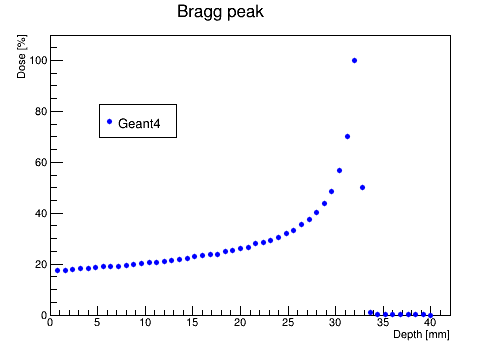 The protons are generated using G4ParticleGun class. 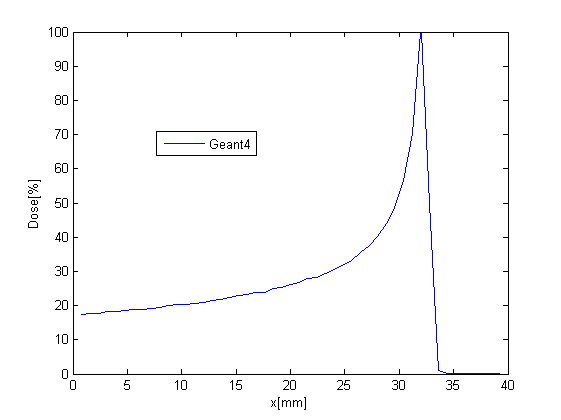 There is an option to chose among several EM and the QGSP_BIC_EMY physics lists. 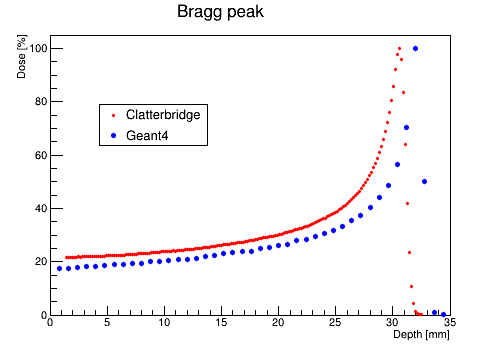 The image shows the water box divided into slices using class G4PVReplica. Protons are in blue, photons are in green. [username@plus1 ProtonPBFolder]$ cp -r /unix/pbt/tutorials/basic/ProtonPB . You can also plot the data in DoseLongitudinalMesh.txt and DoseLateralMesh.txt which were created using commands /score/ in the macro proton.mac. The file DoseLongitudinalMesh.txt will be used later to compare with data from the Clatterbridge Cancer Center. 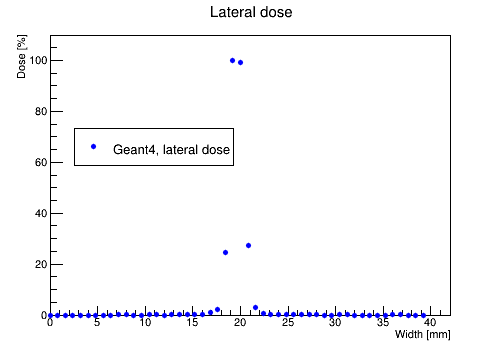 Now, use script PlotLateralDoseMesh.C to plot the lateral dose distribution. Before running the script substitude the commas in DoseLateralMesh.txt with spaces. Remove also the header in the text file. Then, save the text file as DoseLateralMesh_Mod.txt. [username@plus1 ProtonPB_build]$ cp /home/username/ProtonPBFolder/ProtonPB_source/RootScripts/PlotLateralDoseMesh.C . You can change the number of slices. The default number is 50. Keep in mind that if you want to increase the number of slices you need to modify the file DetectorConstruction.hh in /ProtonPB_source/include/. then run the macro proton.mac. If you want to use visualisation, in macro proton.mac uncomment the line /control/execute visualisation.mac. This will run macro visualisation.mac with a specific visualisation setup. If you uncomment the lines /score/drawProjection waterMeshlongitudinal doseDeposit and /score/drawProjection waterMeshlateral doseDeposit you will draw the dose projections. In this example, we use DAWN event display. Before running the visualisation look at this DAWN tutorial. [username@plus1 ProtonPB_build]$ cp /home/username/ProtonPBFolder/ProtonPB_source/RootScripts/PlotData.C . [username@plus1 ProtonPB_build]$ cp /home/username/ProtonPBFolder/ProtonPB_source/RootScripts/ClatterbridgeData.txt . 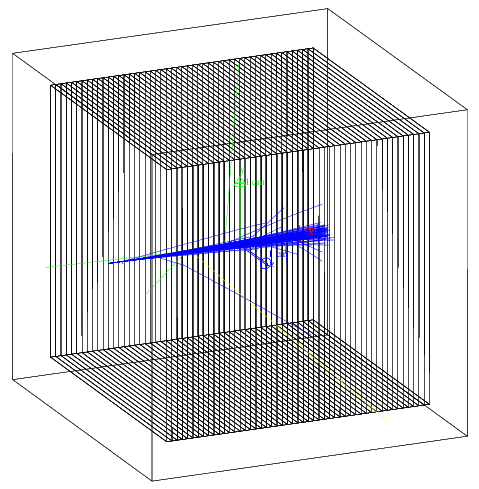 The scripts PlotDataAndSim.C and PlotDataAndSimMesh.C in folder RootScripts compare data with simulation. You can use script PlotDataAndSim.C to compare data (ClatterbridgeData.txt) and simulation (PlotDose.txt). Both text files must be in the folder where you run the script. [username@plus1 ProtonPB_build]$ cp /home/username/ProtonPBFolder/ProtonPB_source/RootScripts/PlotDataAndSim.C . 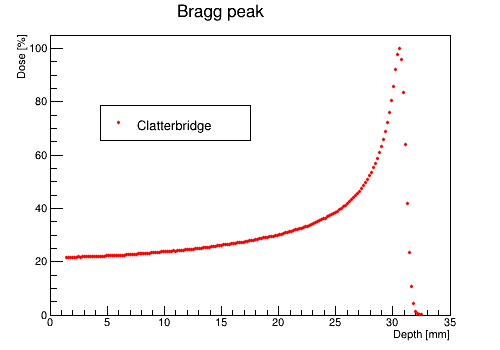 You can also compare data (ClatterbridgeData.txt) with simulation done with scoring mesh (DoseLongitudinalMesh.txt). This can be done with script PlotDataAndSimMesh.C. This script works only if before running it you substitude the commas in DoseLongitudinalMesh.txt with spaces. Remove also the header in the text file. Save the new text file as DoseLongitudinalMesh_Mod.txt. [username@plus1 ProtonPB_build]$ cp /home/username/ProtonPBFolder/ProtonPB_source/RootScripts/PlotDataAndSimMesh.C . This page was last modified on 10 September 2014, at 13:36.